Wall Street's trade war fears are back. President Trump's move to impose tariffs on steel and aluminum from Canada, Mexico and the European Union drove the Dow down 252 points on Thursday, or 1%. The S&P 500 and the Nasdaq lost 0.7% and 0.2% respectively. Trump is placing a 25% tariff on imported steel and 10% on imported aluminum. The tariffs will go into effect at midnight. Investors worry that trade restrictions will raise costs and dent profits for companies that rely on the materials to produce their goods. Wall Street is also on edge about retaliation. 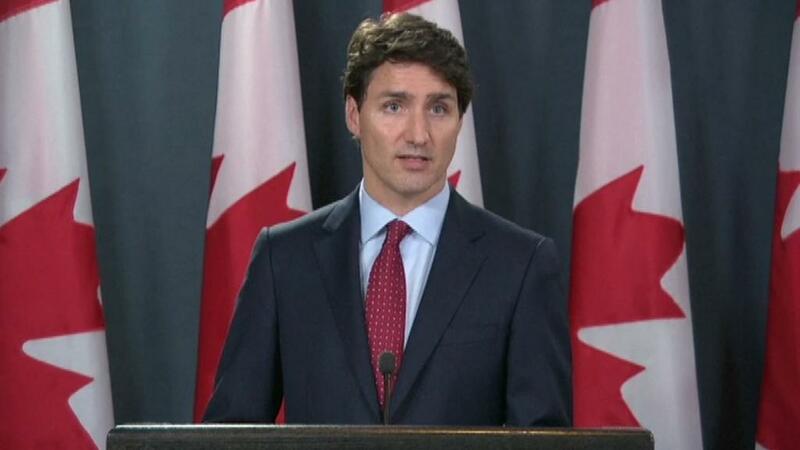 Stocks plunged after Canadian Prime Minister Justin Trudeau announced steel and aluminum tariffs against the United States. Europe and Mexico also announced plans for countermeasures. In addition, the Trump administration is pushing ahead with plans for tariffs on $50 billion worth of Chinese goods as punishment for intellectual property theft. "Uncertainty surrounding tariffs on Chinese imports is a source of concern for some retailers that have operations overseas or use imported goods," the Federal Reserve Bank of Cleveland said in a report on Wednesday. The stock market is having a turbulent week. The Dow lost nearly 400 points on Tuesday on fears that political turmoil in Italy could bring chaos in the eurozone. It made up almost all of that loss on Wednesday. On Thursday, 29 out of 30 companies on the Dow lost ground. Caterpillar was the worst performer, shedding 2%. Caterpillar executive Amy Campbell warned in March that tariffs would be a "negative" for selling the company's construction and mining equipment overseas. Banks also struggled. Goldman Sachs (GS) and JPMorgan Chase (JPM) fell as investors sought a haven in the bond market. The yield on the 10-year US Treasury dropped slightly to 2.82%. Lower yields make it more difficult for banks to make money from loan interest. At the same time, steel and aluminum stocks spiked. The tariffs are designed to make US companies' production more competitive against foreign steel. Webco (WEBC), a steel tubing manufacturer, led the charge Thursday, surging 6%. US Steel (X) jumped 2%. Nucor (NUE), the largest American steel maker, also inched up. Aluminum producer Century Aluminum (CENX) moved ahead 2%. Full tariffs are the "best case outcome" for American steel and aluminum producers, said Moody's analyst Michael Corelli. Canada, Mexico and the EU made up 50% of US steel imports in 2017, according to the Peterson Institute for International Economics. The possibility of tariffs, a healthy economy and higher oil prices have pushed up steel prices 35% since the beginning of the year. Companies rushed to squeeze in overseas steel before any trade barriers took effect, but imports slowed in May. Corelli expects the tariffs to curb demand from overseas in the coming months. He cautioned that American companies can't completely replace lost foreign production. "There will still be imports that will be needed," he said.